← KFest Funk Gonna Give It To Ya! Regular readers will have noticed that I have frequently joined in on the fun of r/Retrobattlestations‘ weekly and monthly retro challenges. I’ve done so with such frequency that I recently had to create an r/Retrobattlestations post category on this blog. These competitions, setup by /u/FozzTexx, generally involve firing up various types of retro computing hardware for a photo or maybe completing a programming challenge, the winners receiving a set of retro computing stickers and sometimes Reddit gold. Recently, things have gotten even more interesting. Back in March there was a challenge that involved dialing into a BBS using an actual telephone modem. The prize was an amazing looking WarGames multi-layer vinyl sticker crafted by Chris Osborn (@FozzTexx) himself. More recently there was a challenge that required a bit of sleuthing, in which Chris posted a video, inspired by the film Real Genius, containing a certain clue that led to a series of actions that may or may not have resulted in your correctly reporting the number of Frito Lay entries Lazlo Hollyfeld submitted to win the grand prize collection. I jumped down the rabbit hole on this one and made it through to the other side. 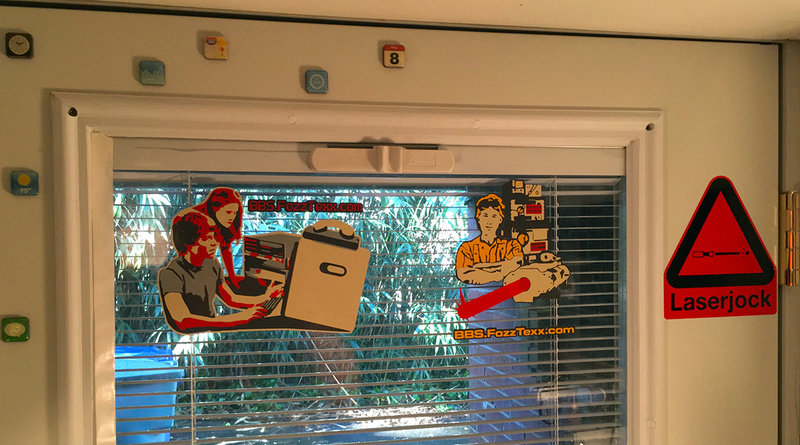 I got the sticker, and the above photo shows the outside door to my basement “Byte Cellar” decorated with FozzTexx’s lovely multi-layer vinyl stickers. I’d encourage anyone reading this post to come by r/Retrobattlestations and see what’s going on. It’s a rather fun little, nicely dusty, corner of the ‘net. This entry was posted in BBS, r/Retrobattlestations. Bookmark the permalink.